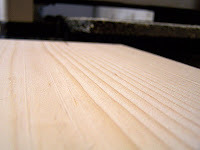 Why you should inspect your wood before planing. 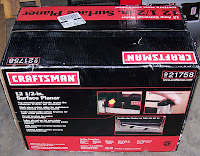 One of the other things I bought myself was this Craftsman 12 1/2" Thickness Planer. I picked it up just before Christmas while the price was still $200. This is a no-frills, durable planer for beginner to professional projects. The 12 amp motor operates at 120 volts using standard household current. At 61 lbs. this unit is lightweight and portable. The maximum capacity of 12-1/2 in. wide by 6 in. thick is probably larger than you will need, but this unit will handle it. The patented Reversible Dust Collection Chute easily connects to a wet/dry vac keeping your shop clean. 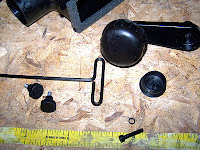 Includes blade magnets and allen wrench. Cutterhead rotates at 9400 RPM for 18,800 cuts per minute; auto feed rate - 26 ft. per min. Maximum depth of cut - 3/32 in. ; minimum work piece thickness - 1/8 in. Let's see what I got when I opened the box before I discuss the features individually. 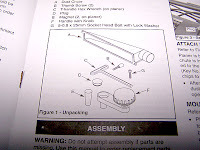 The parts list is confusing because the diagram doesn't really match the parts. 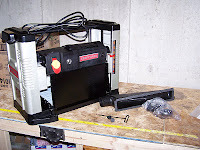 When I pulled the planer out of the box, in the bottom of the plastic bag was the two thumbscrews for attaching the dust collection port. Bad. I nearly threw them away. The blades appeared to be square and parallel to the feed table based on a quick ruler run. The polished stainless bed had a plastic sheet protecting it... Pretty standard. But that sheet didn't come off easily or cleanly. There was adhesive splatter all over the stainless that was a real pain to remove even with acetone. The assembly instructions that came with it were horrible. Nothing at all about the dust port, other than "Attach per Key 3". Huh? Lucky for me it wasn't difficult to figure it out on my own. I got it assembled and ran some scrap 8/4 pine through it. See the results below. I'm going to address the features list first. Here we go. My comments in red. Not if they come notched from the factory. I sure hope so, and that Sears will replace the blades without me bringing the whole thing back. Significant snipe out of the box. 1/16" deep and 3" long. Way counterintuitive. Clockwise brings it up, counterclockwise pushes it down. Couldn't they use a left-handed screw for this? The "key" is a piece of yellow plastic shoved in the switch. Too bad I can't figure out how to get it loose. I was happy with the finish left. Nice and smooth, no chatter marks. A light sanding would be all that is needed. The covers around the unit are plastic. Unfortunate, but even if they were to break they wouldn't affect the performance of the unit. The planer was surprisingly quiet, even when cutting. Of course the stream of chips coming out of the thing was impressive. As is the case for most planers. Note to self: Make sure shopvac is attached BEFORE feeding wood through planer. I would give it an 8 out of 10. EDIT: It was pointed out to me that the "grooves" may be marks left by the drive wheels feeding the wood. That would make sense since it was soft pine I sent through. I'll have to try a hardwood to confirm. But if that's the case, then all is good! 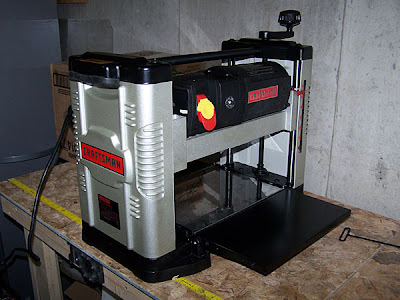 What do you think of this planer now that you have used it for awhile? I have just started looking but don't really want to spend $600. Still love it. I've been feeding everything from pine to hard exotics, and it's been just chugging along. The one issue I've run into is you need to remove the blades and clean the dust out of the slots every so often, otherwise the dust and chips will build up, distorting the blade and/or the bar that holds the blade in place. But I just last week flipped the blades to the other sharp side because of nicks I got from running some wild wood that had metal and sand and gunk in it. Can this planer accept different blades? Can it make molding? I have no idea. Never looked for anything else. First planer I have owned. The guard at the bottom of the cutter head has a section about 1 1/2" long right in the middle that hangs down about 1/16" lower than the rest of it. When I try to plane anything wider than 5" I have to raise it for the work piece to go under that section and then it doesn't remove any material. Please give some guidance.